Rendering of the development proposed for 606 W 57th Street. Image Credit: TF Cornerstone. Latest Clinton/Hell’s Kitchen proposal raised concerns about impact on the City’s infrastructure. On April 1, 2014, the City Council Land Use Subcommittee on Zoning and Franchises heard TF Cornerstone’s application to construct a mixed-use building at 606 West 57th Street between Eleventh and Twelfth Avenue in the Clinton/Hell’s Kitchen Neighborhood in Manhattan. The approximately 1.2 million sq. ft. mixed-use development would create approximately 1,027 market-rate rental units and 207 affordable units. The development will also include 42,000 sq. ft. of commercial or community facility floor area, and up to 500 parking spaces. Manhattan Community Board 4 and then Manhattan Borough President Scott Stringer recommended approval of the application in December 2013. The City Planning Commission unanimously approved TF Cornerstone’s application on March 17, 2014. The development requires a special permit for a public garage with a maximum capacity of 395 to 500 public parking spaces; a zoning map change to rezone the site from a M1-5 and M2-3 manufacturing districts to a C4-6 commercial district to allow for mixed-use development; and zoning text amendment changes to designate the site for inclusionary housing and to allow an automotive showroom. During the Council hearing, Jon McMillan, TF Cornerstone’s Director of Planning, testified that what was unusual about the site was “the very large scale of everything that’s around it.” He mentioned the Sanitation parking facility spanning two blocks over 56th Street and the “monumental Durst Pyramid that is currently under construction.” He also noted that the proposed development is surrounded by a “very large Con Ed plant,” a “very large John Jay College building,” a “large office building,” and CBS Studios. McMillan described the proposed TF Cornerstone development as deferential to the Durst Pyramid. TF Cornerstone’s development will rise to a maximum of 450 feet and 42 stories and be composed of several stacked volumes connected internally through a central vertical core. The eastern portion of the building would have two perpendicular towers of up to 28 stories, which will be connected by a 30-foot wide glass bridge on all floors. The two towers would be topped by a 14-story cubic structure with a 20-foot tall parapet to conceal mechanical equipment. The western segment of the development would be a 17-story structure, which will also be connected by a 30-foot glass bridge, with a setback above the sixth floor. The street line will consist of lower-rise volumes with an approximately 75 foot street wall made of warm, light gray brick. The building would include roof decks and terraces for use by building occupants, as well as a residential lobby on West 57th Street. 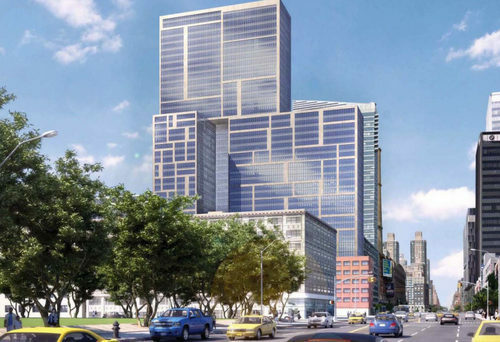 Several retail spaces are also proposed to line West 57th Street and Eleventh Avenue, while West 56th street will be used for service entrances and loading docks. Local Council Member Helen Rosenthal questioned how the proposed development will affect the City’s infrastructure and commented that the proposed development must be assessed in relation to other developments currently underway in the area. She noted that the City had already approved five high rise buildings with an aggregate of over 4,500 new apartments in a five block radius of the development. Describing her district as already overcrowded, Council Member Rosenthal stated that the cumulative impact of the proposed development and already-approved developments would create a significant demand on the City’s public schools and transportation infrastructure. Council Member Rosenthal also questioned the affordability of the low-income rental in the proposed development. She stated that “the reality is that our historic public policy for financing would require that the affordable apartments come in at 60% of AMI. That is just not the population that’s living there. That’s not the population that needs affordable housing.” Council Member Rosenthal stated that “what we really need is 30 % of the housing for people at an AMI between 80% and 160 to 165%,” which includes teachers, construction workers, doormen, and concierges, and social workers. Council Member Rosenthal argued that the City does not possess public policy for affordable housing that will address the needs of the community in which the development is proposed. Council Member Mark Weprin, chair of the Subcommittee, asked the TF Cornerstone representatives about the availability of schools and number of children expected from their development. The representatives responded that conservative estimates show that although the schools in the area are currently under capacity, they will be over capacity for the 2017 build year. Following testimony, Council Member Weprin closed the hearing. The Zoning and Franchises Subcommittee and Land Use Committee voted on TF Cornerstone’s application on April 24, 2014. Prior to the vote, Council Member Rosenthal announced modifications to the proposal. The modifications include inclusionary affordable housing that will continue in perpetuity and be distributed throughout 80% of the development. TF Cornerstone agreed to make available 15,000 square feet to the School Construction Authority to lease for a Pre-K school, develop 17-20 additional middle income units for families, and contribute $100,000 to improve Clinton Cove. The Zoning and Franchises Subcommittee voted 6-0 to approve the application. Council Member Jumaane Williams abstained from voting, stating concerns about AMI levels that are not below 60% AMI. Council Member Rosenthal responded that there is another development nearby that is completely affordable at AMIs of 30% and 40%. She expressed the need for AMIs that reflect the composition of the existing residents who require AMIs greater than 60%. City Council: 606 West 57th Street (N 130337 ZRM – Zoning Text Amendment); (C 130339 ZSM – Special Permit); (N 130340 ZAM – Zoning Authorization) (April 1, 2014).